is a measure of human demand on the Earth's ecosystems. It says something about how many planet Earths we need to support our way of life. If Earth’s history is compared to a calendar year, modern human life has existed for 23 minutes and we have used one third of Earth’s natural resources in the last 0.2 seconds. In 2012 “earth overshoot day” was August 22 meaning that from this day humanity lives beyond the ecological capacity of planet earth. Every year the day arrives a little earlier… in 2009 it was September 25. Read about overshoot day here. Current overuse is due to our consumption of goods and services. The extraction, production, distribution, use, and disposal of the stuff we buy. As a consumer you have the possibility to make a positive difference. 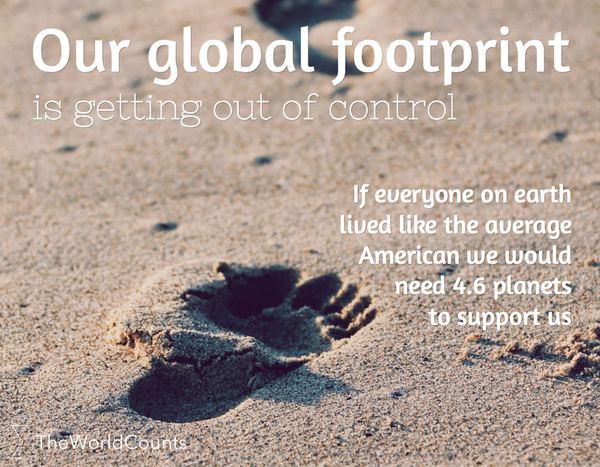 The global footprint network has developed a measure for our use of Earth’s resources. It measures how much land and water area a human population requires to produce the resource it consumes and to absorb its wastes, using prevailing technology. It includes measures of energy, food, timber, waste. At the moment we are overusing Earth at about 160 percent meaning that we need 1.6 planets to support our consumption of resources. Humanity’s annual demand on the natural world has exceeded what the Earth can renew in a year since the 1970s. This “ecological overshoot” has continued to grow over the years. Interested in more facts like the number of planet earths we need? Then plug in and subscribe to our newsletter.